Getting the evening started with two of our panelists for the launch of our Dune Collection, Tracy Davis and Gary Inman. After a successful event to debut our Azure Collection last October, we returned to the Bienenstock Furniture Library during High Point Market in April to debut our newest collection Dune and to hold a panel discussion about “The Power of the Collected.” Our savvy panel riffing on Aristotle’s idea that “the whole is more than the sum of its parts,” included Tracy A. Davis of Urban Dwellings; Gary Inman of Baskervill; Michael Mitchell and Tyler Hill of Mitchell Hill; Bradley Odom of Dixon Rye; and Sabina Fay Braxton, who heads up her eponymous luxury textiles brand. Welcoming everyone to the evening at the Beinenstock Furniture Library. The audience was riveted as Sabina told everyone how she relies on her collected archives to satisfy the discerning tastes of the big names on her client list, which has included Christian Lacroix, Valentino, Armani, Peter Marino, Juan Pablo Molyneux, Catherine Deneuve and even Dumbledore from the Harry Potter films! 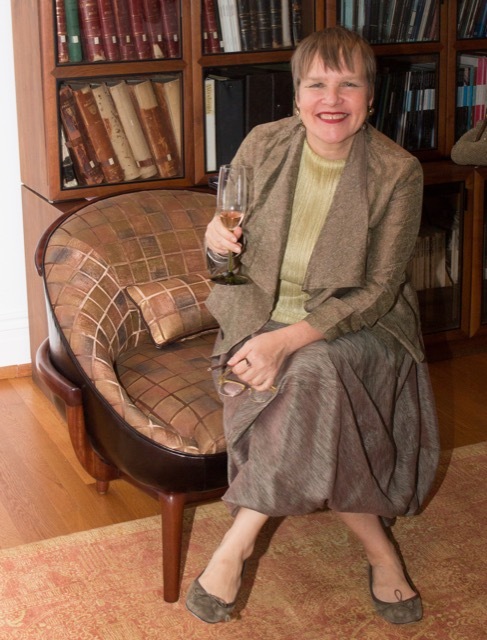 Sabina Fay Braxton seated on the Mali chair covered in one of her fabrics. 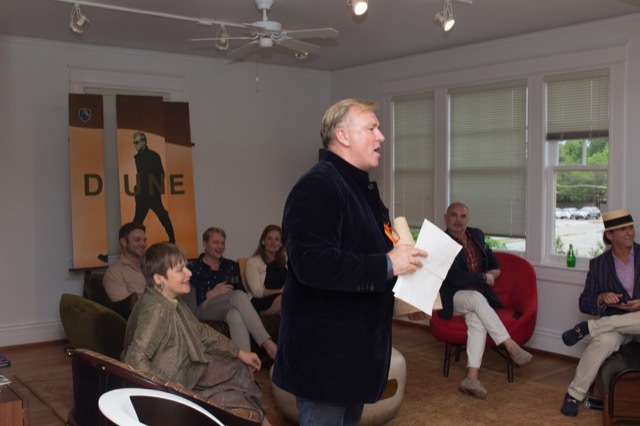 Gary shared with everyone the philosophy he relies upon when creating hospitality projects—his specialty—and spoke about his own impressive collection of furnishings and art for the home, many of the accoutrements he has collected during his extensive travels. 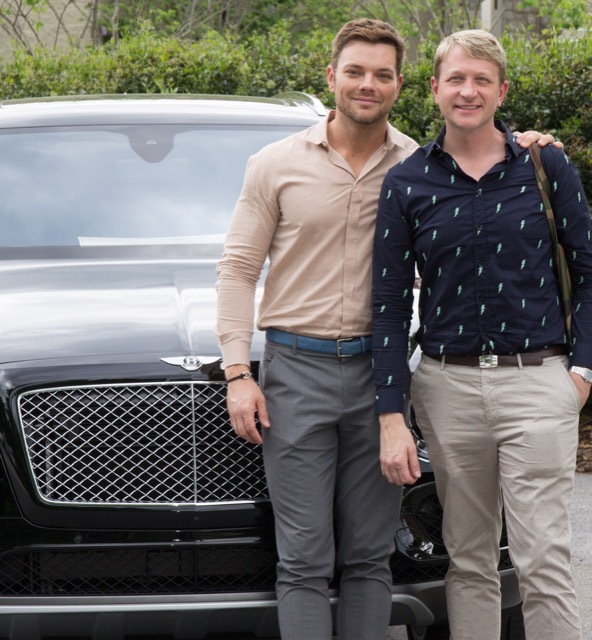 Michael Mitchell and Tyler Hill pose with the luxurious auto from Bentley of High Point. 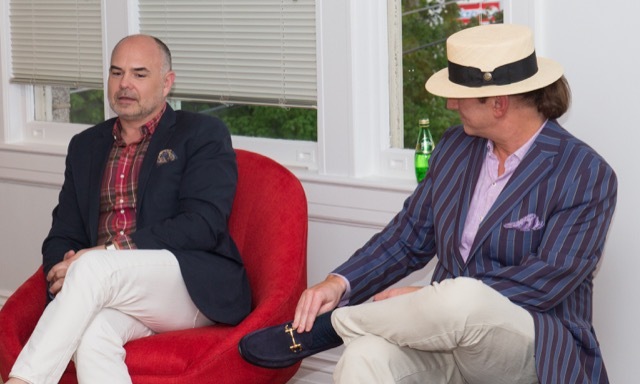 Tyler and Michael, shown above in front of one of Bentley of High Point’s luxury autos, shared their insight gained from creating collected environments for show houses, a question I was eager to ask given their spaces glean an incredible amount of attention when they participate. 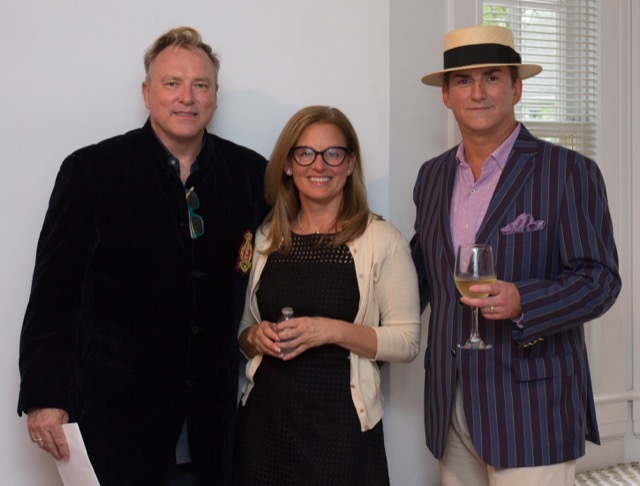 The pair also spoke of their views on trends as they are sourcing for projects and for their popular Charleston shop Mitchell Hill. 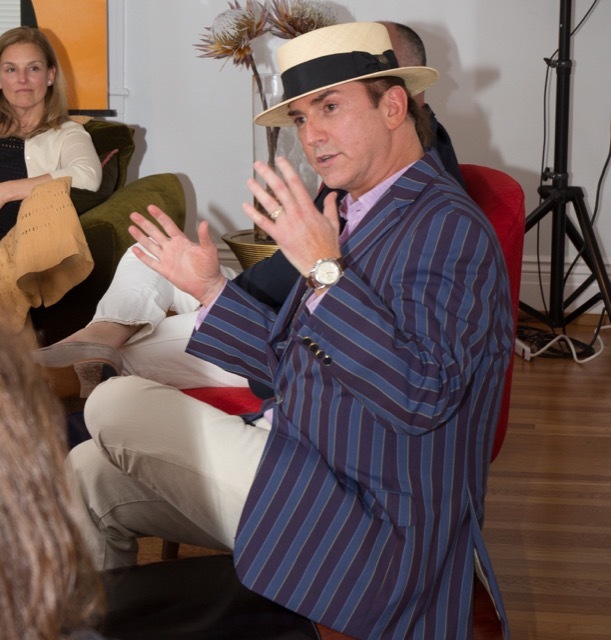 Michael had the audience in stitches as he riffed on some of their favorite finds they collected for their own home. Gary Inman shares his views with our audience seated on the Kalahari Ottoman. Tracy also spoke about how she sources for her Portland, Maine, boutique Urban Dwellings, and for her own home. We’ve seen her in action at the Marche aux Puces in Paris so we knew she’d have some intelligent advice for the audience in this respect. Her brand has a strong point of view, which she instinctively sets as she collects art, accessories and furniture that she sells and places in the refined spaces of her coastal home. Bradley Odom seated on the Namibia chair brought his fresh perspective to the evening. Bradley shared with us all how he views the collected world he has created at his sophisticated shop Dixon Rye in Atlanta. I asked him, “If you are designing a project for someone, do you take into consideration what their desires are in terms of their collection and when necessary, do you adjust your designs to incorporate them?” As he answered, “Absolutely!” we could tell that, for him, working with client collections brings him serious enjoyment when designing projects. Tyler Hill answers a question as Michael Mitchell and Tracy Davis look on, seated on the Dakar sofa. 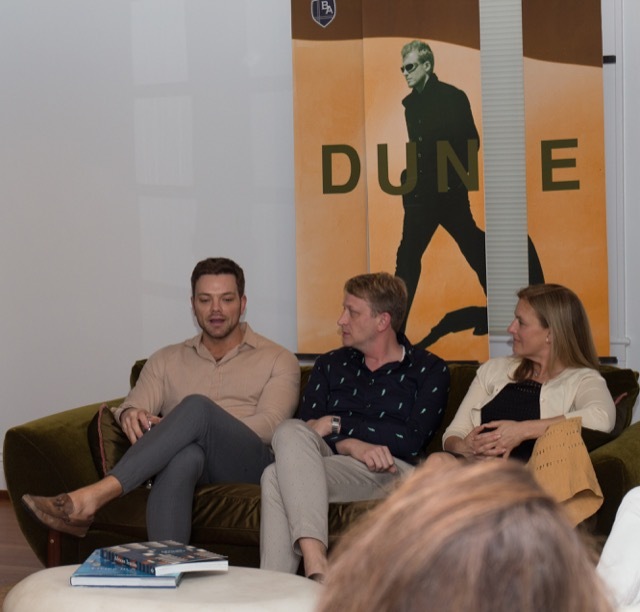 Our panelists were seated on our new Dune Collection, the design notes of which were inspired by my home country of Africa. I set out to capture what a contradiction the continent is, a tableau upon which meaning has been layered for century upon century. Just as when I grew up there, the country still holds a sophisticated urban elite that has made it a distinctive oasis of style within a vast swath of cultural diversity. 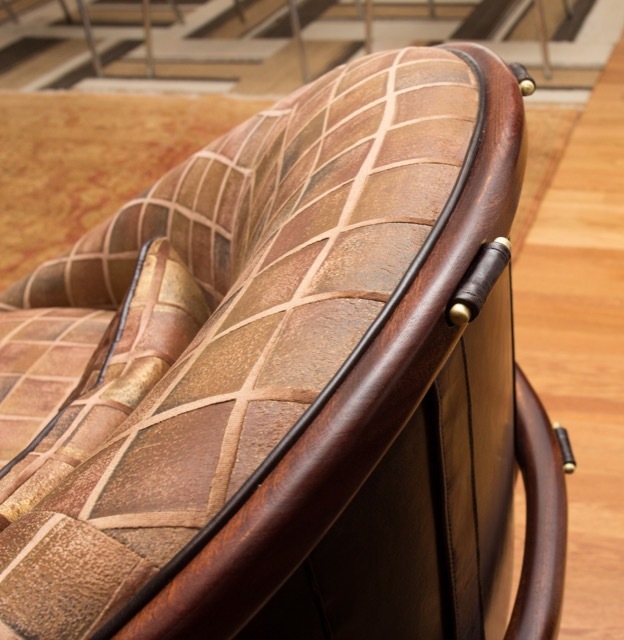 Detail of the Mali chair covered in a Sabina Fay Braxton velvet. 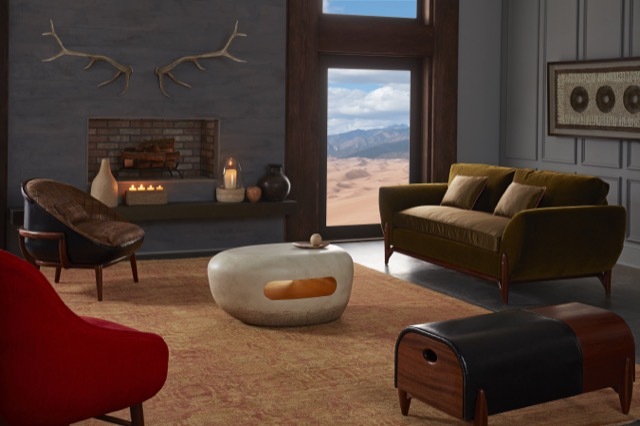 My modern interpretation of the real Africa includes the Dakar sofa, the Namibia chair, the Mali chair, the Kalahari ottoman and the Ghana coffee table. Quietly lurking beneath its sumptuous fabrics and within the sculpted lines of its frames, there is a simmering sensuality with untold degrees of complexity. The initial pieces in our Dune Collection, which debuted that evening. From the ever-shifting desert sands to the exotic notes of saffron, cinnamon and coriander spices from Tangiers. From water pouches carried for long distances over steaming mounds by the Hottentots to the finery worn by the fashionable women of Burkina Faso. From the copper, gold and diamonds glinting from the landscape under an enormous cloudless sky to the brilliant ochre sunsets of the Ivory Coast. And from the drenching reds favored by Masai royalty to the sweep of indigo seas as seen from Cape Peninsula at twilight. All of this, and so much more, is Dune, a collection that is my modern interpretation of the sensory memories I gleaned of a vast continent growing up there. 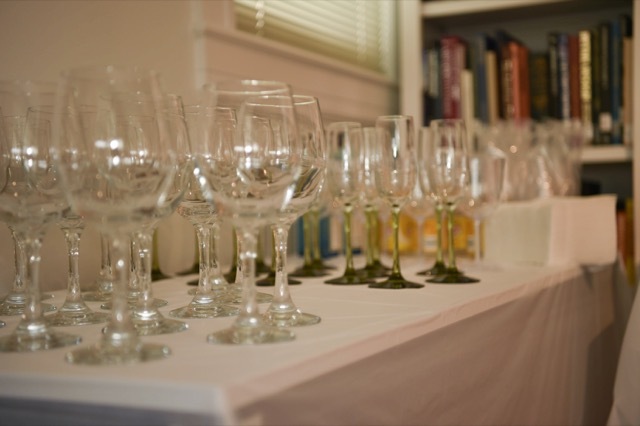 Our Dune Collection during April High Point Market awaiting the panelists and audience for our event. 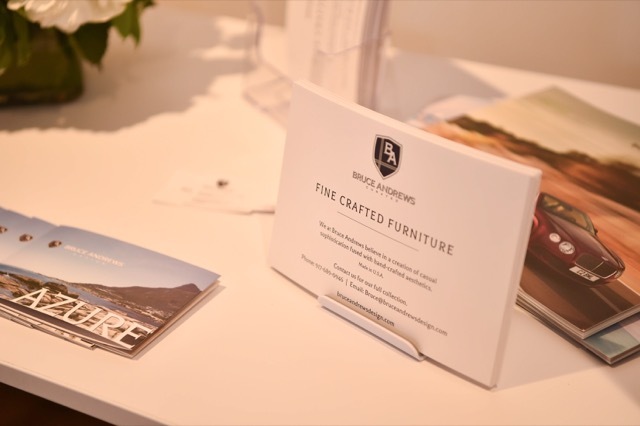 Our point of view is fine crafted furniture that is proudly Made in America. It is always so satisfying when I hear people respond positively to my designs. I do put my heart and soul into everything from the curves of the handcrafted frames that are made in America to choosing the sumptuous fabrics that make our debuting collections so distinctive. 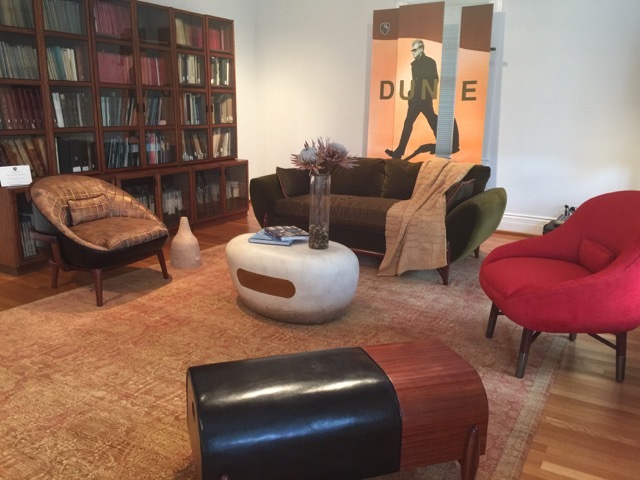 As I develop new luxury furniture collections, I enjoy sharing the story that inspired them so I am happy you stopped by to read about Dune today. Cheers to you all for a happy summer! Cheers to all of our tribe for a happy summer! This post, Our Dune Collection Debuts, © Bruce Andrews Design, all rights reserved. Our Bruce Andrews Design collections are available through Nandina Home in Aiken, SC; Jalan Jalan in Miami, FL; the Ellouise Abbott showrooms in Houston and Dallas, TX; and the Michael-Cleary showrooms in Chicago and Washington, DC. Our new Curated line is available through Nandina and Jalan Jalan, and Mitchell Hill in Charleston, SC; Dixon Rye in Atlanta; and the Redefined Home boutiques in Atlanta.